Looking in my knitting photos folder for September, it looks like it has been a busy month. 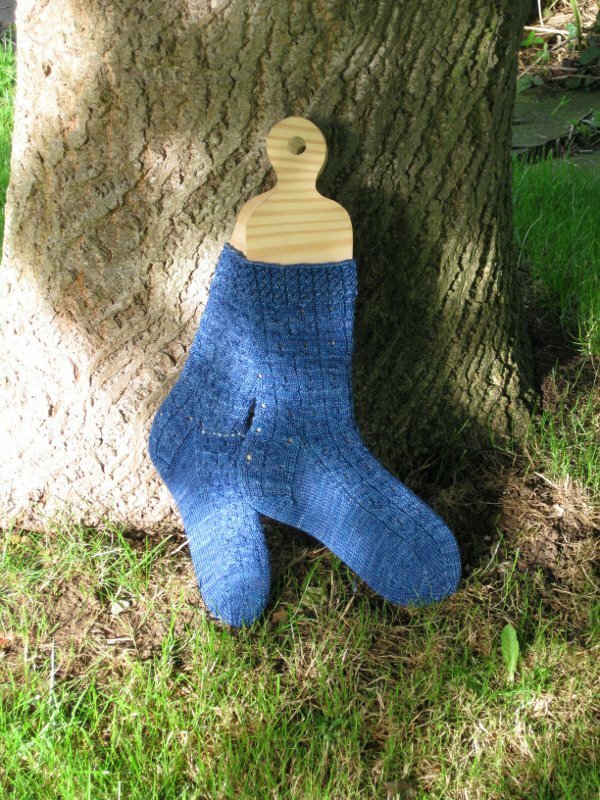 I left you awaiting the release of the patterns for Sock Sniper. They were duly released and I fired my first shot across the Atlantic, taking a rookie sniper from Massachusetts out of the game. Not my fastest knit ever, but they were started on Sunday and posted/fired on Thursday in a week where I was at work, but with nothing optional in the diary to allow for extra knitting. Two weeks later, socks in progress arrived from my original target’s target. Dream in Color Smooshy Cashmere was the yarn and knitting it was like being constantly stroked with the softest fluff imaginable. I was reluctant to let it loose from my grasp, but the game is the thing. The socks arrived halfway down the first heel-flap, so I had three-quarters of a pair to knit in a week with a lot in the diary. The socks accompanied me to hear the Archbishop of York and the Bishop of Bradford. They were admired by nuns and became part of a conference on social media. The socks left here a couple of weeks ago, heading back to the States where they took out a sniper who had just fired her third shot. Since then, I’ve been waiting. The commander in chief tells me that socks in progress are on their way to me, but they have yet to arrive. Out of 100 snipers who began the contest, there are only 5 left. I’m the only one outside the USA. I am already the last surviving member of my platoon, and the last international sniper. Is it possible that I might get even further? The Swirl – This is my current tv knitting. I have re-knit to the point when I realised my mistake and it is now growing again. I’ve lost interest in the Amigurumi project, I haven’t knit on my mitred squares scarf for a while and the KAL cotton squares for the blanket have not multiplied. I’ve been spinning on the wheel. Previous PostPrevious Ready, aim, fire!